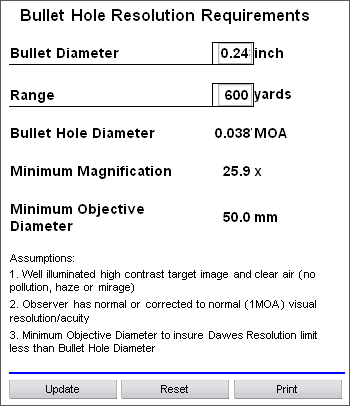 High-magnification scopes allow shooters to aim more precisely and to see their targets better at long ranges. 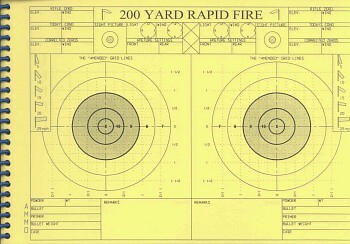 Recent years have seen an “optics arms race” in benchrest shooting. It used to be thought that 36-power was plenty for 100- and 200-yard BR matches. Now, top shooters are running 40- or 45-power optics, and some competitors are even using 50X and 60X scopes. Extra magnification comes with a price, however. With equal-sized front objective lenses, the view through a 50-power scope will appear darker than the view through a 35-power optic, and the 50X will have a much smaller exit pupil. The exit pupils on some scopes are under 1mm. An exit pupil that tiny makes your head position ultra-critical — move your head very slightly and you’ll lose the circle of light entirely. Small exit pupils are more fatiguing, causing more eye strain. Higher magnification can, in some conditions, also make it more difficult to cope with mirage. 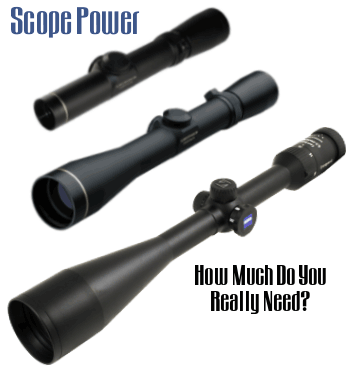 Many shooters prefer a zoom scope so they can dial down the magnification when the mirage is extreme. So how much magnification do you really need? That comes down to your personal preferences and your budget. Since a good zoom scope, such as the Nightforce BR 12-42×56 or the new Sightron SIII 8-32×56, lets you “back off” your power, there’s really no reason NOT to go with a high-power scope on a target rifle, provided you can make weight. Share the post "Calculating Scope Resolution Capability"
Readers often ask for a good, authoritative resource on doping the wind and reading mirage. Many Forum members recommended M.Sgt. Jim Owens’ Wind-Reading guide. This is now offered on CD, with 22 sets of wind charts. Owens’ Reading the Wind and Coaching Techniques clearly explains how to gauge wind speeds and angles. Owens, a well-known High Power coach (and creator of Jarheadtop.com), offers a simple system for coming up with wind value based on speed and angle. The CD also explains how to read mirage — a vital skill for long-range shooters. In many situations, reading the mirage may be just as important as watching the wind flags. Owens’ $9.95 CD provides wind-reading strategies that can be applied by coaches as well as individual shooters. M. Sgt. Owens also offers excellent log books for High Power shooters. The Owens Data Book features an updated design with “amended” grid lines and twin plotting bulls for rapid fire. Much more than just a shot log, Owens’ books offers eight sets of wind charts, a wind speed estimating guide, a “gun round count page”, a scoring system chart, an equipment check list, and a guide for normal come-ups from 100 to 1,000 yards in 100 yard increments. There is also a special Long-Range Data Book with 54 two-sided pages for the 600-yard stage, 54 two-sided pages for the 800/900/1,000 yard target, 14 sets of wind charts, and larger plotting areas. Price for either the standard Owens Data Book, or the Long-Range Data book, is $14.95 plus $1.50 S&H. Share the post "Good Wind-Reading Resource on CD"